Guest Accommodation Main deck : Master cabin Lower deck : Two double cabins can combine into a large VIP cabin. One double cabin and another cabin (which can be configurated in a twin or a double cabin) can be converted into a VIP cabin. Motor Yacht SENSATION was built and launched by Sensation Yachts of New Zealand in 2007. M/Y SENSATION has been designed by Sensation’s own design team including interiors by designer Gelko Kaniza. 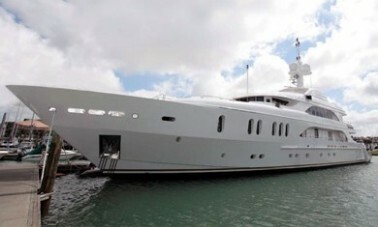 She is 50m, is constructed of aluminium, and built for a most exclusive clientele. The luxury yacht is superbly luxurious, with an interior enhanced by an abundance of warm cream furnishings and exotic woods. SENSATION has accommodation for 10 guests in five staterooms. Her full width owner’s stateroom is located on the main deck and is particularly worthy of mention. A king size bed is positioned on the port side whilst a large dressing room takes up the starboard side. Forward of this stateroom the owner’s en-suite offers ‘his and hers’ facilities and a magnificent central bath (pictured below). Aft of the owner’s dressing room, a study completes this elegant space. Moving aft on SENSATION’S main deck, you will enter a magnificent entrance lobby featuring a spiral staircase leading to the upper deck, the formal dining room, and finally the main lounge which is furnished with a selection of comfortable sofas and a large plasma TV screen. On her upper deck, the ‘Vista’ lounge has been designed with two large semi-circular sofas, a grand piano and a bar and is a great place to entertain or relax. Large circular doors aft lead outside to a teak laid upper deck, and a large circular dining table, where the luxury yacht’s guests can dine in style while watching the sun go down. Tenders & Toys 2 Tenders and 2 Jet-skis (wave runners) Donut Water-skis. Audio Visual Equipment and Deck Facilities All cabins have plasma screens, CD and DVD players. All saloons have plasma screens, CD and DVD players. Central music available on all interior and exterior decks. Sky TV in all cabins and saloons. Upper deck saloon with Grand Piano (manuel and digital). Communications SAT Phone, Internet (WIFI), Fax.